(1) Metal Cant Flashing: Standing seam required at corners of cant. See SBS Roof Systems - 12.5 Seams. 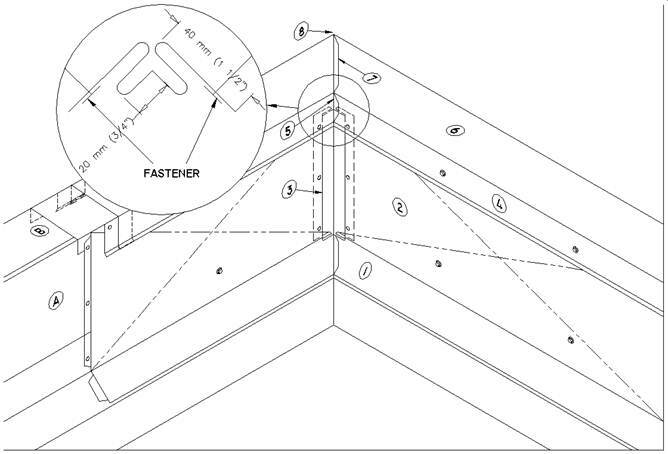 (2) Metal Base Flashing: Vertical runs over 100 mm (4") require standing seam or S-lock corners. See SBS Roof Systems - 12.6 Cap Flashings, Base Flashings and Reglets. Cross-breaks and cladding-type fasteners are optional. (3) Double S-Lock Corner: Fastened through concealed flanges to top of parapet. Again, see SBS Roof Systems - 12.5 Seams. (4) Metal Cap Flashing – Interior Face: Fastened with continuous clips or cladding screws evenly spaced between seams. Over 100 mm (4") width requires standing seam. See SBS Roof Systems - 12.6 Cap Flashings, Base Flashings and Reglets for requirements. (5) Seam: Lap seam is acceptable if vertical distance is not more than 100 mm (4"). Again see SBS Roof Systems - 12.5 Seams. (6) Metal Cap Flashing – Top Face: Over 100 mm (4") width must provide positive slope to roof area. (8) Metal Cap Flashing – Outside Face: Corner standing seams may be folded flat on outside face only. Fasten with continuous concealed clip-type fasteners or cladding screws evenly spaced between seams.